Tibet is considered the Buddhist capital of China, causing many not familiar with China’s geography to believe that Buddhism came to China from India through Tibet. But with the highest mountain peaks in the world, the Himalayas, separating India and China, Buddhism had to take a different route. Instead, it entered northern China through what has become known as the Silk Road. As a result, some very early Buddhist art can be found in remote northwestern regions of China. One such example are the Buddhist cave art in Dunhuang, an oasis town situated in the Gobi Desert which with its desert climate was able to preserve this art. The Mogao Caves are probably the best known. But any trip to the Mogao caves by a Buddhist art novice leaves one with many questions on the art, the history and its significance. Fortunately, China Law & Policy had the opportunity to sit down with Dr. Neil Schmid, an American expert on Buddhist Studies and Dunhuang. If you are in Beijing, Dr. Schmid will be speaking on these issue next week, September 23 at 7:30 PM at the Courtyard Institute. EL: Thank you for joining us today. First, can you give us a little bit of background on the caves: when were they first constructed, why and by whom? NS: Elizabeth, thank you for inviting me. So there’s a story, maybe apocryphal, that in 366 [CE] a monk by the name of Le Zun had a vision. This is a vision that happened outside of the oasis of Dunhuang, in a small, small ravine with a cliff face. There he had this vision that he was basically to build a cave. This is, again maybe it is apocryphal, is the originating story of the Mogao caves. EL: And what year was that again? NS: 366. So he was followed by another monk, Fa Liang, and then a series of monks after that. EL: So can you explain more why these caves were created? NS: As I said initially they were dug out as meditation spaces. Spaces where monks could live relatively distant from Dunhuang or some sort of urban or town center due to spiritual practices. This is the origin of these caves. Then what happens over time, over the centuries, is that the site becomes a pilgrimage site and with these powerful monks – spiritually that is – people began to patronize them. In doing so, they began building caves themselves. These people were typically the elites or also groups of people who would gather together and fund the digging and the construction of a cave in Mogao, in this area. You asked about whom they were actually built by. So they had funders, they had donors, but there was – and we have a lot of information especially from the 10th century on. We know that it was a professional class of artisans who actually did the construction work – painters, sculptors, metal smiths, textile workers. They were organized hierarchically according to their expertise and their titles reflected their skill and their standing. So these are the people who actually built the caves and we can talk a little bit later about that process of building itself. EL: So that’s interesting that you talk about the professional class of artisans and also just the changes over who was sponsoring the building over centuries. 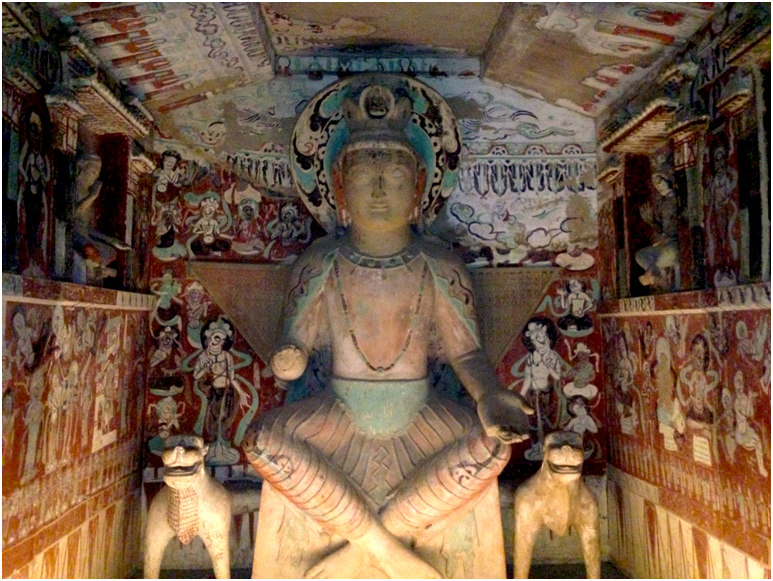 When you go to the Mogao caves themselves, you do see some changes to the art when you visit different caves. Can you explain more or highlight what some of those changes are from the beginning to the later parts. And do you believe there’s a high point to the art itself? NS: The earliest caves we have are from the Northern Liang and that’s 397 [CE] to 439 [CE]. These caves are very, very heavily influenced by Indian and also Central Asian styles. The motifs, the iconography, the sculpture, is very, very much dominated by something other than Chinese. Over the years, these artistic forms and iconography and also the ritual space itself begins to shift away from monks towards an increasingly lay-oriented perspective. What the caves also take on in terms of transformation of the artistic styles and ritual styles is an increasingly sinicized, i.e. Chinese aesthetic. So for example what happens later, you have stories about Indian, about the Buddha done completely in Chinese costume, in Chinese-like settings. 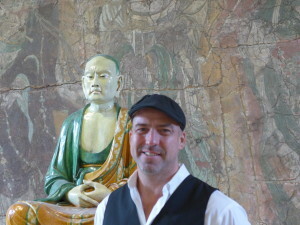 It naturalizes in some ways Buddhism for Chinese. We see this very clearly evidenced in the caves. EL: I know some art historians believe that some dynasties have better art than others or higher-end art than others. Do you agree with that? I think everyone always thinks the Tang Dynasty but how do you deal with that? NS: That’s a good question. I could talk about my personal favorites. NS: I particularly like Tang, what’s known as high Tang style. But it is very, very difficult to say one style is a high point. Obviously it depends on the reference points of what you consider a high point. There’s amazing artistic skill that goes into the creation of earlier caves in terms of actual painting styles which are now lost in China. So in some ways you could say that due to their introduction and disappearance, these were high points in particular artistic styles. EL: That’s fair. I guess the other thing is when visiting the caves you can’t help but wonder how starting in 400 AD, people were able to paint and build such amazing art. In particular, there is that one awe-inspiring Buddha. Do we know exactly how these caves were built? How the painting was put onto the walls? How many people it took to build these caves? I think you were already talking a little bit about the professionalization of the artisans. If you could go into a little bit more depth about that. NS: So what happens in the Tang, the Five Dynasties period, and also in the Song, is that you have elite families funding the construction of caves and in the process they create what is essentially a painting academy. At this painting academy you have trained artisans. Note that they are laity; they are not monks, they are not clerics. We have lots and lots of documentation from this period and detailed manuscripts about what they were paid, how often they were paid, were they lived, the types of work, individual specialties. We know that laborers were typically paid in food, so cooked meals. Also oil, also grains. This was a typical form of payment. How the caves themselves were actually constructed, they were constructed by starting at the top of the interior of a cave and then digging it out and down. So what they would do then after it was dug out is they would begin to furnish the walls and then apply a straw and stucco mix. Then on top of that begin the painting process. In this period, again very late Tang, Five Dynasties period, Song period, it became very programmatic, very organized in terms of the pictorial program of the caves themselves. And very standardized. They used a variety of drawings for example to create on a regular basis the paintings in the caves. They also used something called “pounces” which is a piece of paper with dots cut in that they would then typically blow a paint across to get an outline. Then they would color that in. 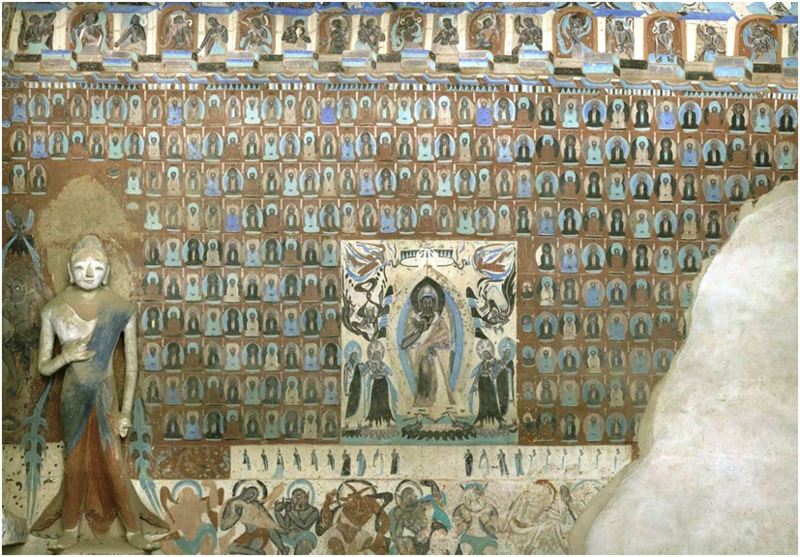 One of the motifs you see again and again at Dunhuang in the Mogao caves is the Thousand Buddha motif. Early version of Thousand Buddha motif. EL: Right, right. You see that it is painted like in an assembly line. NS: Exactly. There is this whole modularity to the construction and also the painting process. Then the paint themselves typically use things like -the expensive ones – lapis lazuli and malachite. 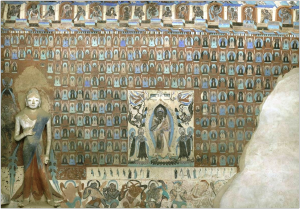 The painting was done on dry stucco and again through a series of artisans. The construction of a cave, or a large cave, during this period would be perhaps a year. It would take a year. On the construction of the caves and guilds, see Sarah Fraser’s excellent overview, Performing the Visual: The Practice of Buddhist Wall Painting in China and Central Asia, 618-960 (Stanford University Press, 2003). To read Part 2 of this two-part interview series, please click here. A selection of Dr. Schmid’s publications and talks can be found by clicking here. 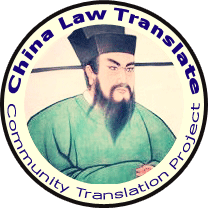 Or join Dr. Schmid at the Courtyard Institute in Beijing on September 23, 2015 at 7:30 pm. Silk Road, depicting a camel pulling a cart typical of trade missions of thaat period. ← Should Obama Downgrade Xi’s Planned State Visit?